Please Login or Register in order to read this sample. Purchase direct from the Well-Trained Mind Press and get Free Product Support! If you have multiple students using Writing With Ease, this additional set of Level 4 Student Pages will save you loads of time and work! 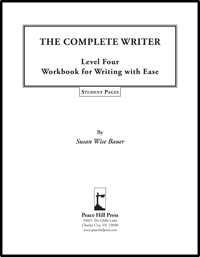 The Writing with Ease Level 4 Workbook already contains one set of Student Pages. If you need additional Student Pages for use in your family, you’re free to make copies from the Workbook. Many parents find it easier to skip the photocopier and simply purchase this additional copy of Level 4 Student Pages. The text for the narrations are included, however instructions for the parent or teacher are not included in these Student Pages. Those instructions can only be found in the Workbook. You can get this product as a handy downloadable PDF, so that you can reprint them again, and again, and again, and again. We know your kids REALLY want to do these exercises more than once… Or you can choose a shrink-wrapped packet of loose-leaf papers that are hole-punched and ready to go into any standard three-ring binder. NOTICE: These Student Pages may take several minutes to download if you choose PDF. Copyright Information Your purchase of this PDF is for your own personal use. You may not copy it either for resale or to give away to others. Making copies, either for resale or to give away, is a violation of United States law. According to the United States Copyright Office, “Copyright infringement occurs when a copyrighted work is reproduced, distributed, performed, publicly displayed, or made into a derivative work without the permission of the copyright owner.” For further information, see http://www.copyright.gov/help/faq/faq-definitions.html. The sample link is neither a PDF nor a sample?